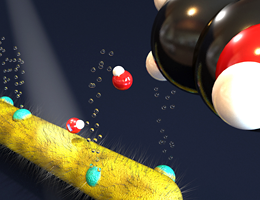 An LMU team affiliated with the Nanosystems Initiative Munich (NIM) has achieved a breakthrough in light-driven generation of hydrogen with semiconductor nanocrystals by using a novel molecular shuttle to enhance charge-carrier transport. The amount of solar radiation that reaches the Earth in a year exceeds our current annual energy needs more than 10,000-fold. However, it is not yet possible to store sufficiently high amounts of solar energy in an efficient way. A promising approach is to utilize incoming solar radiation for the photocatalytic generation of molecular hydrogen (H2) from water. Hydrogen gas is an excellent energy source, with the product of its combustion being again water, thereby making it free of greenhouse gases. In their latest experiments with semiconductor nanocrystals as light absorbers, physicists led by Professor Jochen Feldmann (LMU Munich), in collaboration with a team of chemists under the direction of Professor Andrey Rogach (City University of Hong Kong), have succeeded in significantly increasing the yield of hydrogen produced by the photocatalytic splitting of water. The crucial innovation, reported in the latest issue of the journal Nature Materials, is the use of a so-called molecular shuttle to markedly improve the mobility of charge carriers in their reaction system. The basic principle behind photocatalysis seems to be quite simple. When a quantum of light (a “photon”) with sufficient energy excites a semiconductor nanocrystal, it produces a negative charge (electron) and a positive charge (hole). Photocatalytic synthesis of hydrogen gas from water requires the transfer of electrons to the hydrogen, while the holes interact with the oxygen or are scavenged by other molecules. However, before any of this can happen, the photogenerated electrons and holes must be quickly separated from each other. If the semiconducting nanocrystals are decorated with nanoparticles of a metal catalyst – such as the precious metal platinum – the electron can rapidly transfer to the metal and hydrogen production ensues. But unless the positively charged holes are effectively removed, they will accumulate and eventually bringing H2 synthesis to a halt. One problem for an efficient removal of holes is the need of polar molecules being attached to the nanocrystals as surface ligands in order to make the nanocrystals water-soluble. By doing so, however, the resulting “ligand forest” of the attached polar molecules makes it difficult for the holes to interact with water or larger scavenger molecules. One can compare this to the problem of delivering airline passengers to their final destination. Spatial constraints obviously make it impossible for the aircraft to convey its passengers directly to their hotels in town. Instead, smaller and more maneuverable carriers, such as the shuttle buses, are used for the short last stage of the trip. In a similar way, the research teams in Munich and Hong Kong hit on the idea of using one of the smallest constituents of their system – the hydroxyl ion formed by the dissociation of water – to penetrate the ligand forest, collect the holes from the surface of the crystals and transport them to a larger acceptor molecule. Moreover, the concentration of this molecular shuttle in the system can be easily controlled by altering the pH of the solution. Indeed, raising the pH of the solution drastically increases the rate of hydrogen production. “I was amazed the first time I tried it. As soon as I increased the pH I could see, with the naked eye, bubbles of hydrogen rising to the surface.” says Thomas Simon, a PhD student at Professor Feldmann’s chair. The new system also has other advantages. First of all, its long-term stability could be markedly improved. Furthermore, it turns out that the costly platinum catalyst can be replaced by nickel, a far less expensive metal. “The discovery of this new mechanism could lead to entirely new approaches to the photocatalytic production of hydrogen.” adds Dr. Jacek Stolarczyk, who heads the Photocatalysis group at the chair of Photonics and Optoelectronics (PhOG) at LMU.